Andrés Senra (Madrid, 1968). Artist. He holds a BSc in Fundamental Biology from the Universidad Complutense de Madrid and has completed courses in philosophy, aesthetics and history at the Universidad Nacional de Educación a Distancia. Awarded the MAEC-AECID ART-EX grant in 2014 and an MNCARS Art Research Grant in 2013-2014, in 2012 he was selected by the Goethe-Institut and Instituto Cervantes for the ‘Participar.de’ project. In 2012 and 2013 he was among the beneficiaries of an MECD grant for the promotion of Spanish art abroad. In 2009 he received the Madrid Procesos grant from AVAM and Karl Hofer UDK, Berlin, and in 2005 was artist in residence at La Casa Encendida in Madrid. 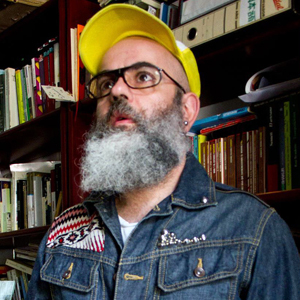 Winner of the Casa Velázquez Prize for Artistic Creation at Estampa 2009 and a 2008 Artistic Creation Prize from the Madrid Region, in 2016 he showed part of his photographic output at the Archivo queer?’exhibit in the Van AbbeMuseum, the Netherlands. Ojalá estuvieras aquí proposes a reflection on migration as an aspiration to utopias, possible futures and individual dreams that may or may not be fulfillable. Starting from recent emigration and the exodus of Spanish culture in flight from precariousness at home, the image oscillates between artistic intention and document, biography, affectivity, archive, media and story. The narrative is fragmented. Video creations, actions and portraits offer deepening levels of insight. At times investigation, document or oneiric, dystopian imagery. Through this journey, the author seeks to produce an emotional map of emigration. The protagonists are Spanish expatriates in the Americas and Europe, carrying out actions, sharing testimonies and appearing in the video artworks. Ojalá estuvieras aquí I “Todos somos migrantes” (42’47”) proposes an overview of displaced people, appropriating the image offered by the media. Testimonies from Maghrebi immigrants in Spain read by Spanish emigrants and a series of actions by the author. Ojalá estuvieras aquí II “4 de julio” (30’56”) documents a journey along the west coast of America with three Spanish expatriates in Portland (Oregon). Their conversations range over the difficulties they face as emigrants to the USA, a comparison between the political systems of both countries, and the failures of communist and anarchist utopias, as well as offering a distanced view of the political situation in Spain. Valla (16’28”) depicts the confusion and the difficulties of a border crossing. Displaced (8’52”) locates us in New York, city of migrants, eclipsed by ever tightening border controls. Retratos: Testimonies of expatriates and their journey. Acciones: Participants perform an action about emigration. The search for or loss of a home, problems of communication in the new setting and with their loved ones, the move itself, the process of adapting, and fears over lack of official papers are recurring topics.